If I had a dollar for every time one of my friends asked, “Alyssa, when are you getting engaged?” I would be able to afford the wedding of a century. I may have missed the mark on earning some extra cash, but I sure struck it rich with the man of my dreams. On Monday, May 23rd, Jared decided he wanted to spend the upcoming holiday weekend in KC. 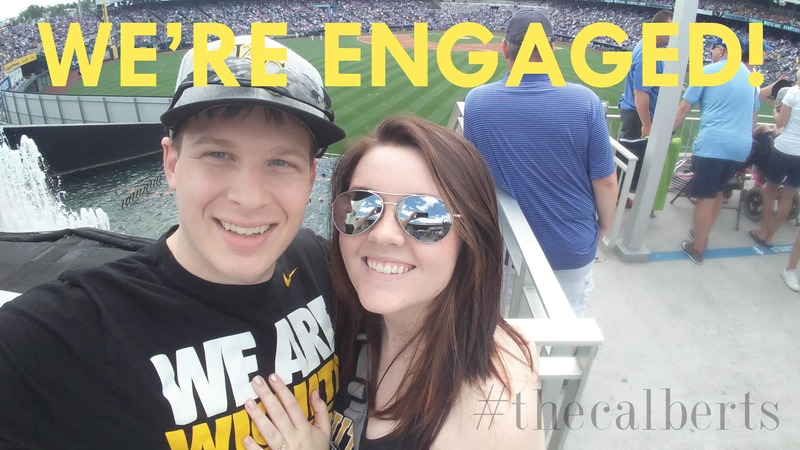 He was able to get cheap tickets to the KC Royals game for Wichita State Day at The K, and I was pretty excited since I had never actually been to a baseball game. We spent the next few days figuring out hotel plans and activities to fill our days. I was excited to spend time with Jared and thought that he wanted to take the trip as a last hurrah before he began his new job. On Friday, May 27th we had planned our usual Friday date night. I was expecting Emps (Emperor’s Japanese Grill a.k.a. really cheap & delicious fried rice) and maybe a movie at home. When I got home from work that day, a few hours before Jared, I put my hair up in a ponytail and threw on a t-shirt, only to later be informed that Jared really wanted to go to much nicer (MUCH NICER!!) restaurant and “start the weekend early.” I complained a little, because I didn’t want to put on makeup or change my outfit. Not to mention, dinner at Sabor was going to cost six-times as much as getting food at Emps. Jared was pretty set on the plan, so I didn’t put up too much of a fight because Sabor’s food is really good. I put on a new outfit, dabbed on some mascara, and then proceeded to gather my things into a purse. Jared called me into the kitchen and stood me by the door. He gave me a hug and kiss and said some mushy things about love. He went on to say that he wanted to spend the weekend celebrating us as he got down on one knee and he asked me to marry him. I cried a little, but thankfully my mascara was waterproof. We then hurried to dinner. Jared later assured me that he would have proposed to me outside in our backyard, but it was raining. The weekend in KC was spent doing pretty much whatever we felt like. We went to the Royals game, spent an evening in Power & Light, went to bed pretty early each night, walked about 9 miles each day (shoutout to my FitBit for that fun fact), lost all our money at the casino, people watched at the Plaza, and counted naked people at the Nelson Atkins Museum of Art. I love this. I love you guys.